The hospitality industry—which encompasses dining establishments, lodging places, tourist spots, and events, among others—is a very competitive one. This can be clearly seen in the cutthroat restaurant business. To stand out in this field, restaurant owners need to make use of various marketing strategies to distinguish themselves from the rabble. One way for restaurateurs to do that is to use printed advertising media like rack cards. 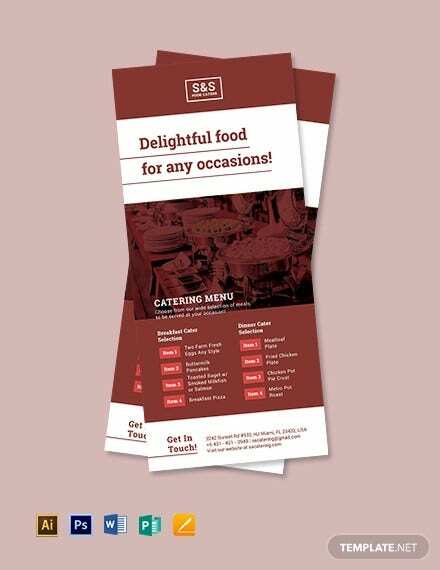 In this article, we provide business owners with comprehensive information on how to create and use rack card templates for their own dining establishments. Tips on how to maximize this advertising strategy are also provided along with multiple examples of downloadable rack card templates for any restaurant type out there, so read on. Transform your burger restaurant or sandwich joint by using the Burger Restaurant Menu Rack Card Template shown below. 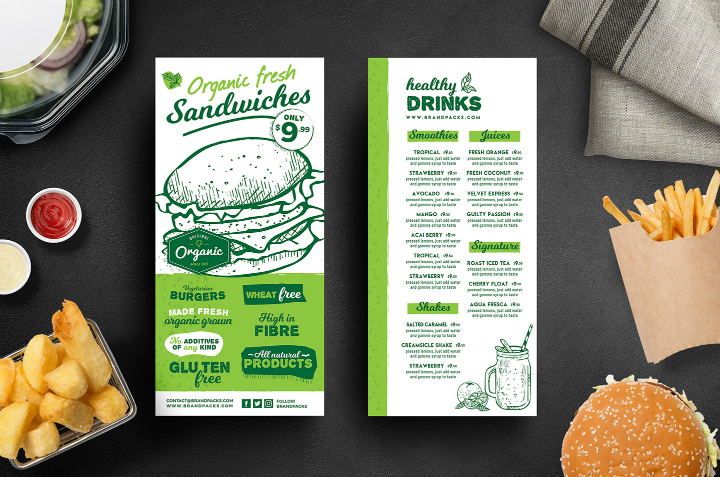 This rack card template doubles as a burger and sandwich menu design template. Still, it may be used as an advertorial rack card for any kind of dining establishment as long as you modify the burger food icon on the card’s front page. Also, note that this template is created and stored using Adobe Photoshop and Illustrator, so make sure that you have either of these software programs before you edit it. Cafe bistros are another kind of dining establishment sprouting almost everywhere these days. 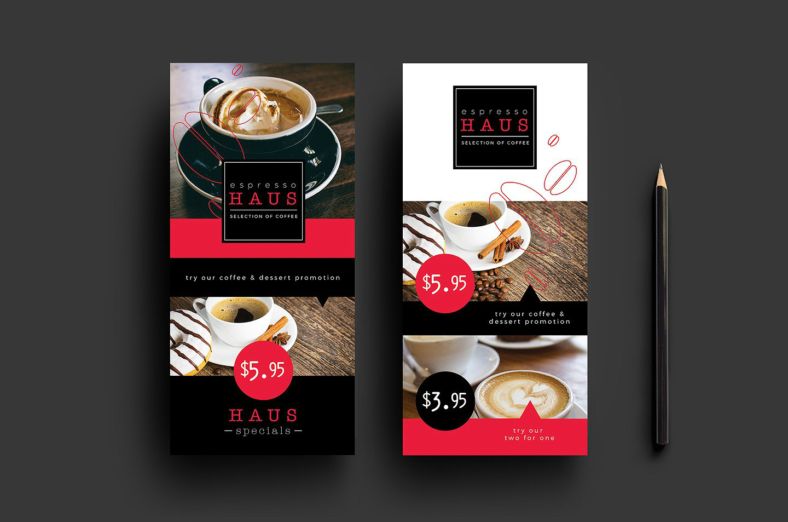 If you are a cafe owner, spread the word about your business by using the Cafe Rack Card PSD Template shown below. This printable template will allow you to creatively show the different coffee brews that your place offers. You are free to change up the colors, text sizes, typeface styles, and images as long as you know how to use Adobe Photoshop or Adobe Illustrator. Check out this article to read up on easy Photoshop tutorials. On another note, this rack card can also serve as a good bookmark template design since it is printed on two sides. 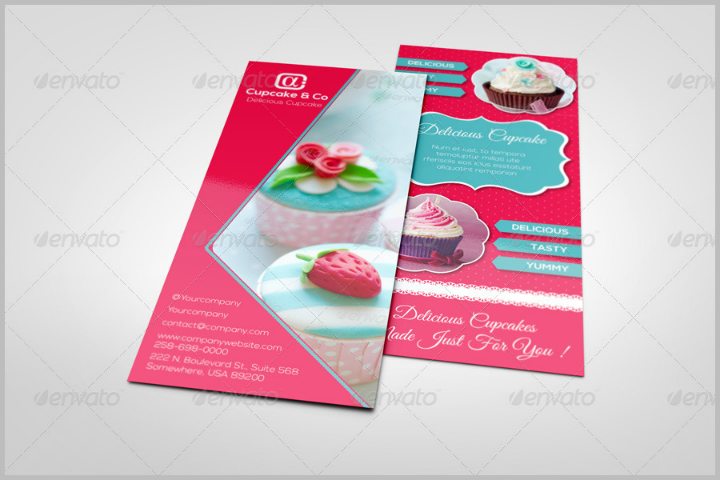 Awaken the inner sweet tooth in people by using an appealing template design just like the one used in the Cookie Shop Rack Card Template featured below. This printable rack card template makes use of beautiful food photography as the focal point in the template. 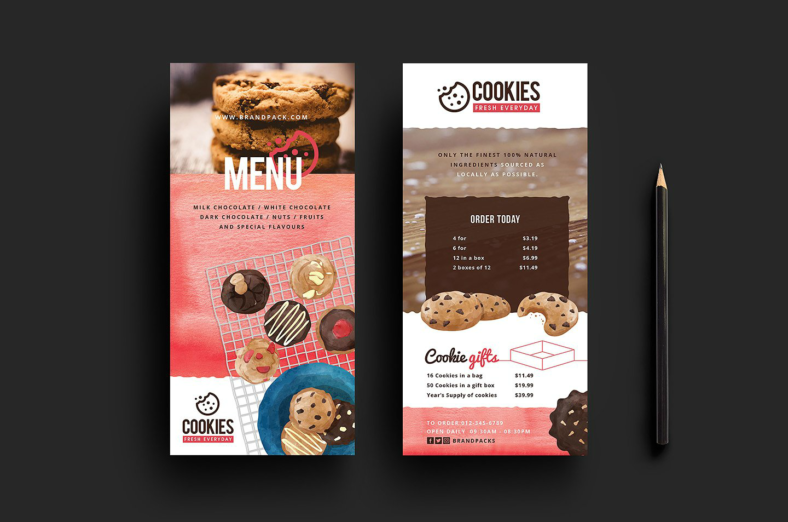 So, if you are already operating a pastry or cookie shop and restaurant, your business will certainly see more customers in the coming days after distributing rack cards with this design. Enliven this card template by adding equally cheerful food and cupcake illustrations or social media icons in the shape of cookies. You can easily do that since this template is fully editable in either Adobe Illustrator or Photoshop. Fine dining restaurant owners, rejoice! The Steakhouse Restaurant Rack Card Template featured below will certainly hype up your establishment more. Use this rack card template if you want to maintain an atmosphere of elegance and exclusivity to your restaurant, but still be able to attract more customers from different market segments. This printable card template may be distributed to current and prospective diners alike. Tip: Add your own restaurant logo design if you want to increase the recognizability of your business. 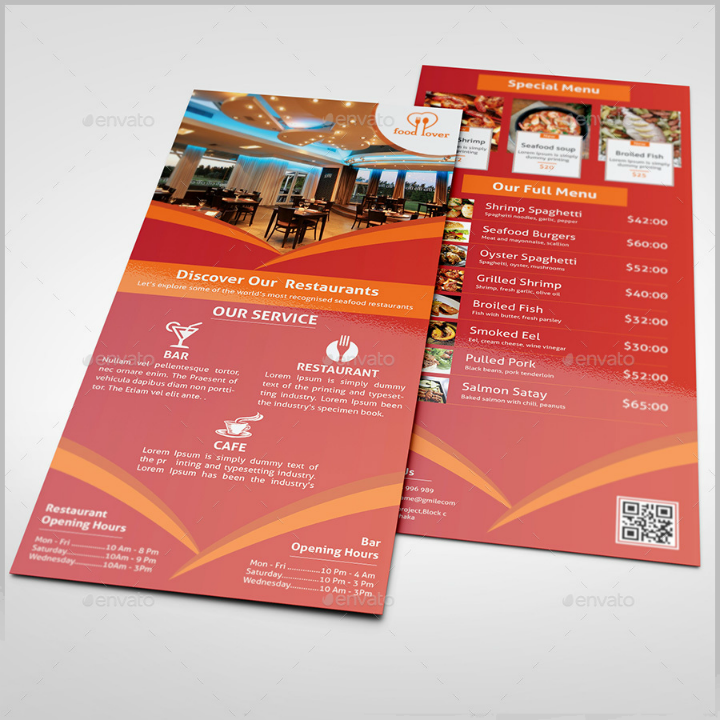 The Formal Restaurant Rack Card Template shown below is another rack card template that suits fine dining restaurants that want to gain more customers through print advertising. This template allows you to provide information about your restaurant as well as a menu list. Customers tend to be more attracted to promotional material that gives them different service or product choices. To promote customer engagement, do not forget to include your restaurant’s social media information in the template to harness the power of social media marketing. Use card stock or thick paper cut into sheets measuring 4 inches by 9 inches when you print out this template. It also includes a pre-formatted 3 mm printing bleed so you do not need to worry about cutting the margins after printing. In addition, this template prints on both the front and back portion of a piece of paper. So, get your printer ready for this printing setting or you may have the template printed at a professional print shop. Bakery owners will love the Free Bakery Rack Card Template embedded below because it contains all the graphic design elements that pastry lovers will find appealing. Choose this printable template to attract the trendy crowd, but do not forget to make equally delicious pastries that your customers will crave. The template is also fully customizable for other kinds of restaurant businesses. Just make sure to add your own business icons and use a color scheme that will match your restaurant’s theme. To customize this template, you may add original photos of the different pastries that your bakery makes. This is a sure-fire way to let your customers crave the gastronomic experience they will get at your bakery. Use the Yummy Restaurant Rack Card Template (shown below) if you want a more upfront way of advertising your restaurant through a rack card design. This template mainly shows the different meal prices that your restaurant offers. It works effectively in luring customers since the food items and dishes are paired with drool-worthy photos of their best dishes. Tip: When using this rack card template, do away with the dollar signs since this can negatively affect the customer experience. 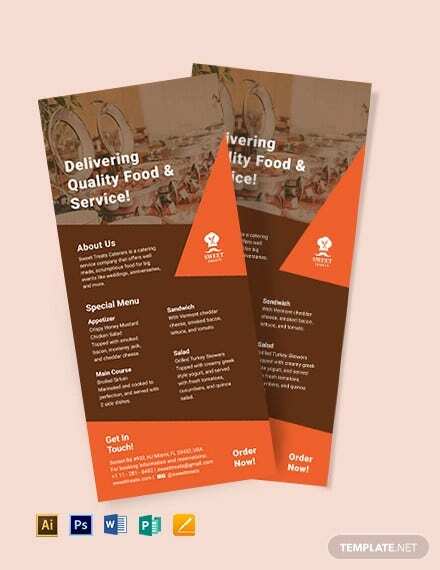 To find out why, read more about restaurant menu design hacks and apply the tips when creating your restaurant rack card. The template is available in four color variations (red, blue, green, and orange). It also includes a 0.25-inch print bleed and follows the CMYK color model. Note that images are not included in this mockup template. You will need to add the real pictures of your own restaurant’s dishes. One business establishment that a town should have is an ice cream shop due to the novelty and the sense of uniqueness it brings. If you want to start one, then use the Ice Cream Restaurant InDesign Rack Card Menu Template featured below as a way to help advertise your new business venture. This is a two-sided card measuring 4 inches by 9 inches. It also available as an InDesign template so it is easier to edit and customize. The ice cream illustrations on this template are embedded in it, so they may not be easily removed if you do not have ample editing skills in Adobe InDesign. Aside from that, the other elements of the template are fully editable. Looking for a rack card template design that will appeal to health buffs and right nutrition enthusiasts? Then, the Juice Smoothie Bar Rack Card Template shown below is the template design for you. This 4-inch by 9-inch rack card can easily be placed strategically at your juice bar’s counter for customers to peruse while they wait for their orders. The template follows a slight chalkboard design look which appeals to a wide variety of people. You may also add your own fitness logo designs if you prefer. Note that the graphic layers and headers are not editable in the template. However, if you wish to customize it for another kind of restaurant, just ask the original seller and creator to make the changes for you. There may be an additional cost for requesting this change, though, so keep that in mind. Are you the owner of an Italian restaurant? 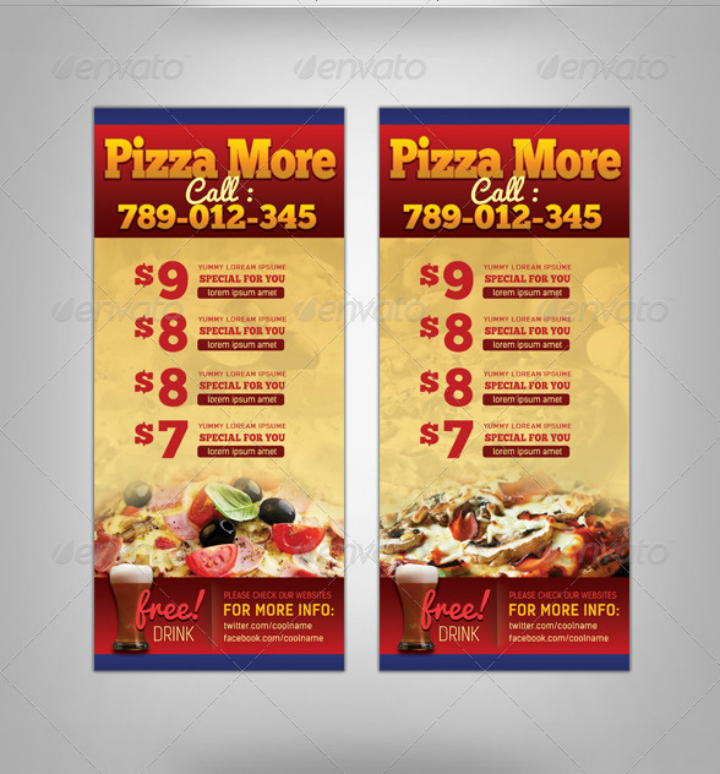 If yes, match up your Italian restaurant menu cards with the high converting Pizza INDD Rack Card Template shown below. 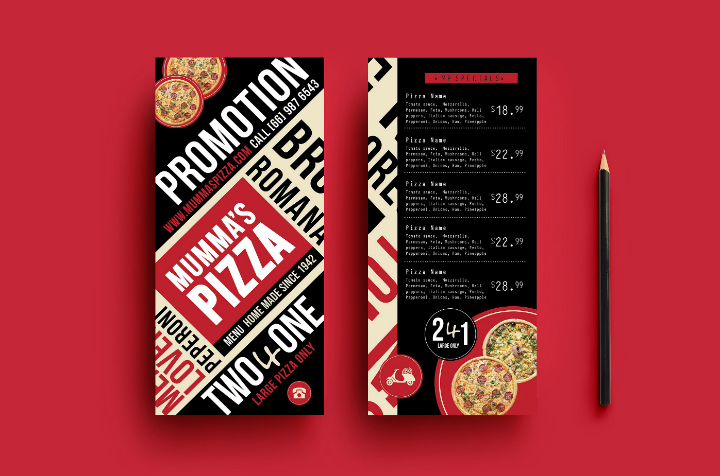 This rack card template primarily shows the affordable pizza menu pricing paired with a tastefully taken picture of a pizza slice. It is an informative rack card that will answer almost all a customer’s questions. It contains the pizza prices, the restaurant contact details, a call to action, and a freebie offer. The Pizza Restaurant Menu Rack Card Template shown below is another pizza place menu template that suits those who want conservative-looking menu design templates. This rack card template includes a brief menu list on its reverse side. Its front cover design appeals to those who want an edgier twist to their food choices. The red and black background color scheme also helps give the pizza restaurant a sense of credibility. When printing out this template, make sure to use sturdy paper or thick card stock. This makes the card more durable. Do you own a traditional restaurant that needs to gain more customers? We suggest using the Retro Restaurant Rack Card Template (example embedded below) as your printed advertising and marketing tool. To personalize this rack card template for your own restaurant, do not forget to use and add your own food images. You may also change the restaurant company logo design to match your own restaurant’s logo. Aside from that, you may choose a different color palette to complement your own restaurant colors. 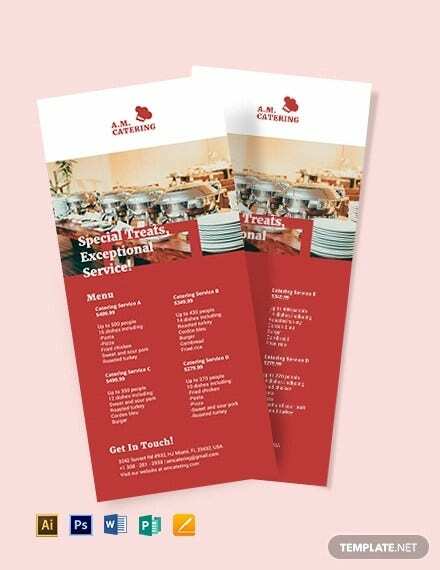 To make sure that the menu list you include in your rack card template follows industry standards, read up on these tips for things you should know about restaurant menu cards. 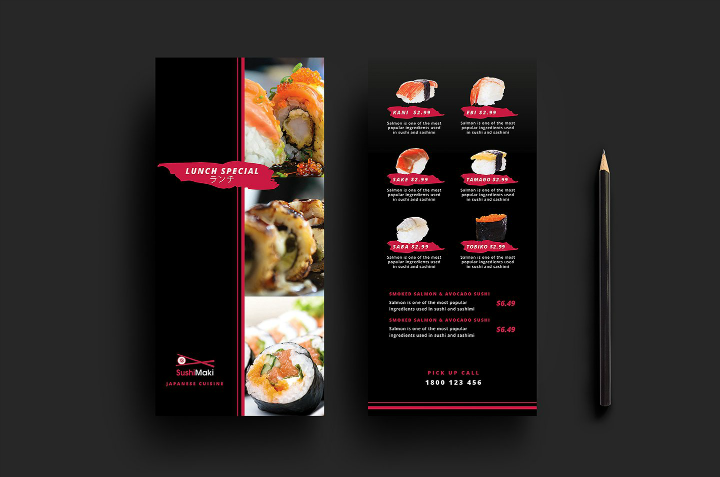 Specialty cuisine restaurant owners will love the Sushi Restaurant Rack Card Template shown below as it can be used to promote your restaurant with ease. This template follows a black and red color scheme—something that will work well if you want your restaurant to exude a feeling of elegance. Owners of fine dining restaurants should also use this kind of rack card template. To make your rack card template more appealing, do not hesitate to add beautifully captured photos of your sushi dishes. 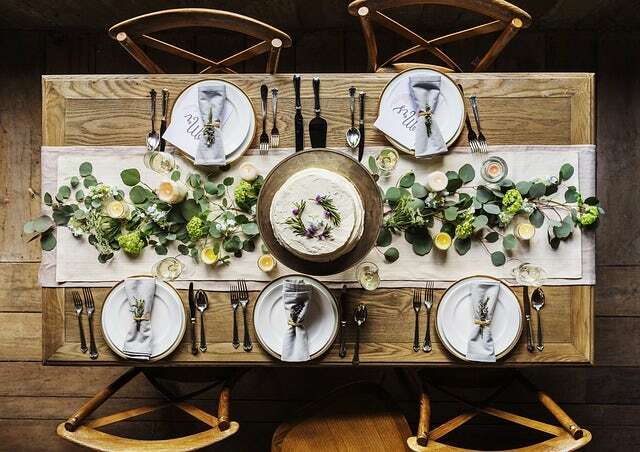 Harness the power of food staging to make the dishes more appealing. As a double-sided card template, it is best to use thick card stock when printing it out. Also, make sure to use readable font styles and include menu descriptions to aid customers in understanding the menu items. Check this article for more information on effective menu description writing tips. 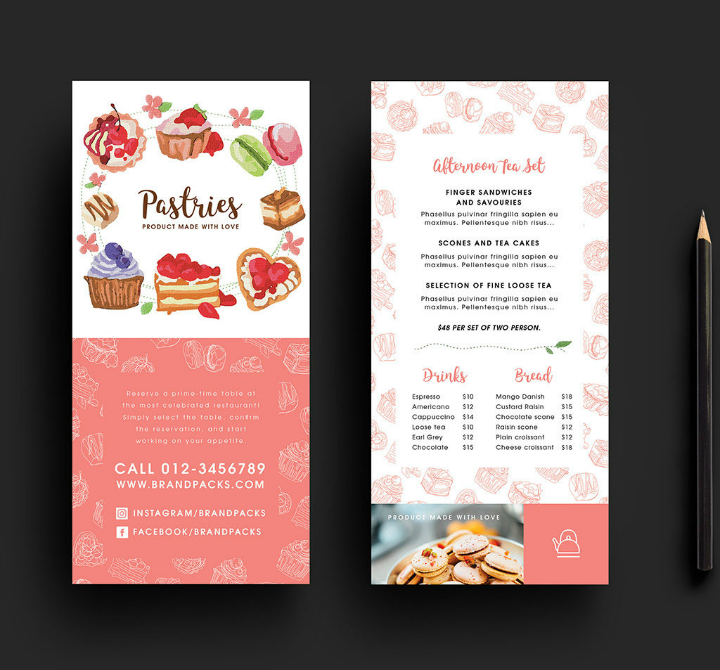 Dessert-focused restaurants can also amp up their advertising practices by using advertising templates like the Sweet and Cupcake InDesign Rack Card Template featured below. This rack card template follows a modern and clutter-free look. Pastry-shop owners (and their customers) love this template since it tickles their fondness for cute and clean-looking things. It also works well when you include pictures of cupcakes with creative toppings and decorations. The use of cursive fonts adds to the template’s appeal, too. 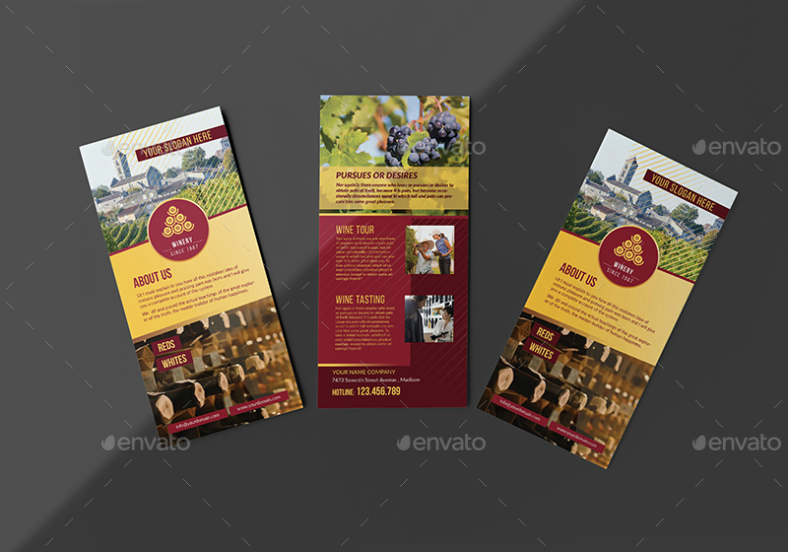 Last on this list of restaurant rack card templates is the Winery Rack Card Template. Wine lovers and wine bar owners will find this appealing because of its simplicity. A rack card is a type of printed document detailing a business establishment’s list of products and services in a creative and easy-to-understand manner with the intention of attracting more customers. This type of printed media got its name from the place where they are usually positioned at store premises: at rack stands near a store counter or at the receptionist’s desk. Rack cards can also resemble brochure cards due to their size and shape. To distinguish them, the rule of thumb is that rack cards are often printed on double-sided 4-inch by 9-inch thick paper or card stock. Some business brochure templates may be printed with this paper size, but this is not typically done. In a way, a rack card can also be compared to a business card when it is used to promote a particular business or person. The main difference between rack cards and business cards, though, is their size. Therefore, use a rack card design if you want more space to include more information about your business. They are a creative way to promote your restaurant. 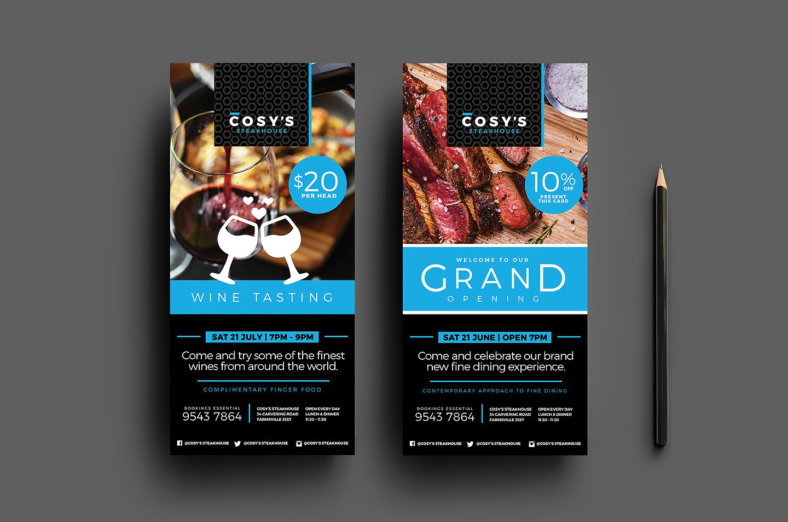 Rack cards serve a variety of purposes, one of which is to promote your restaurant business. A rack card can do this because they can be given away to customers as a form of advertising material. Restaurant rack card designs should accurately showcase your food offerings so that customers will know what they will get when they dine at your restaurant. Remember, your rack card design should be creative enough to distinguish it from other restaurant rack cards. Check out this article for more tips on restaurant marketing. They double up as an advertising flyer. Creative design is important because this helps capture a person’s attention and, ultimately, transform him or her into a loyal customer. Businesses use rack cards as handy and subtle forms of printed advertising media since customers first refer to them as a source of information about your restaurant. But, once they get past that stage, the rack card will become a more direct line of communication between you and your restaurant customers. You may read more about sustainable marketing strategies in this link. They can be used as a menu card. Restaurateurs can take a more proactive approach when dealing with their rack cards by incorporating sample menu card designs on them. This way, your customers can see the restaurant menu right away. What differentiates a restaurant rack card from a regular menu card is that the customer may take the rack card home with them to use for future reference. Regular restaurant menu cards, however, are usually left at the restaurant and will be reused for any customer. If you want this flexibility in your restaurant menus, choosing the rack card design route is preferred. They are easy to distribute. Another advantage of using rack cards is that they are easy to distribute. To illustrate, fast food chain owners may have a staff member distribute rack cards to passing customers outside their restaurant premises. The card’s size and format make this possible since they are handy compared to brochures and flyers. Rack cards, too, can be placed near your restaurant’s counter and customers can freely take one card if they like it. Just like any restaurant flyer template, there is no obligation for people to buy from your restaurant when they receive the rack card. Instead, they are treated as potential leads. Wise restaurateurs should take advantage of this avenue and make sure to tap this source by creating appealing and authentic restaurant rack cards. They are easy to create. Crafting any form of printed media requires skills in both graphic design and copywriting. With pre-formatted rack card templates, these things are already taken care of. This especially applies when you use InDesign rack card templates since these templates already include text and graphic placeholders. All business owners need to do then is to fill in these text boxes with their own restaurant information and menu details. 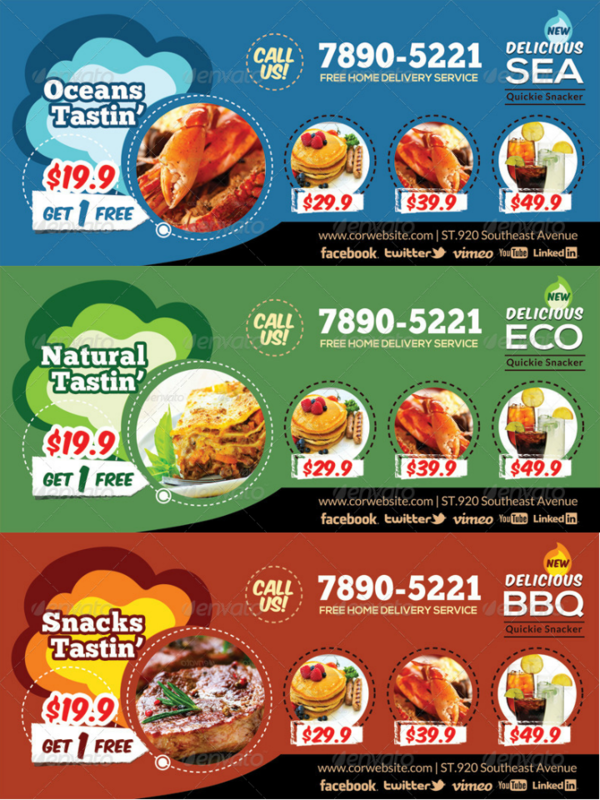 Check out the collection of rack card templates for any kind of restaurant embedded below. Carefully choose and download the template that you deem will best showcase your own restaurant’s image and vision. All these restaurant template designs are ready to print, so make sure to get your printer ready, too. This rack card template is fully editable. In fact, you may add your own wine menu design to the template. It can then be used as a separate wine menu for your restaurant. Just like other printable designs, it is best to use thick paper or card stock for this rack card. This lends more formality to the rack card and it will also last longer. 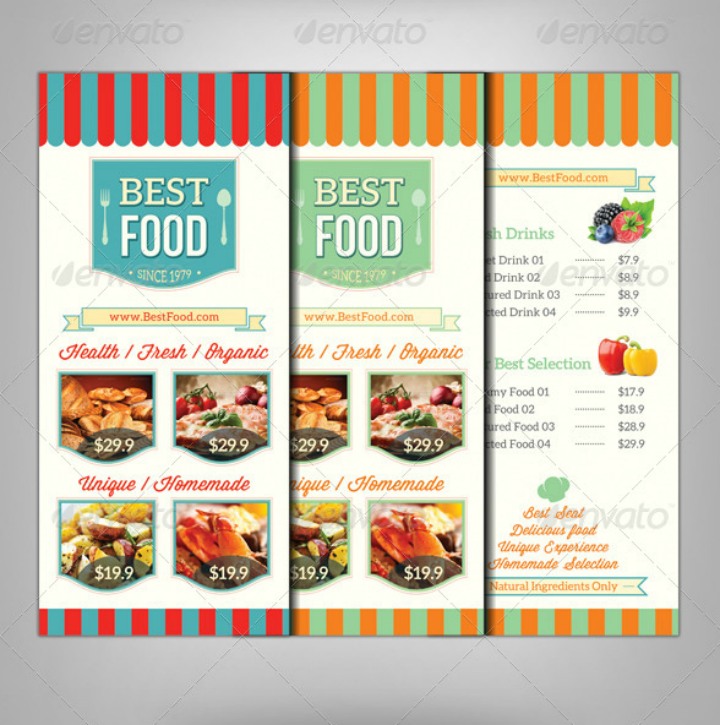 We know this collection of restaurant rack card templates can be overwhelming. But, once you have a clear vision of your restaurant’s brand identity, everything will be easier. Choose the template that you feel will best express that identity to your target market and soon you will reap the benefits of a successful marketing plan. It does not matter whether you use free card templates or premium rack card template to achieve that. What is important is that you find ways to improve your business strategies and outpace your competitors.